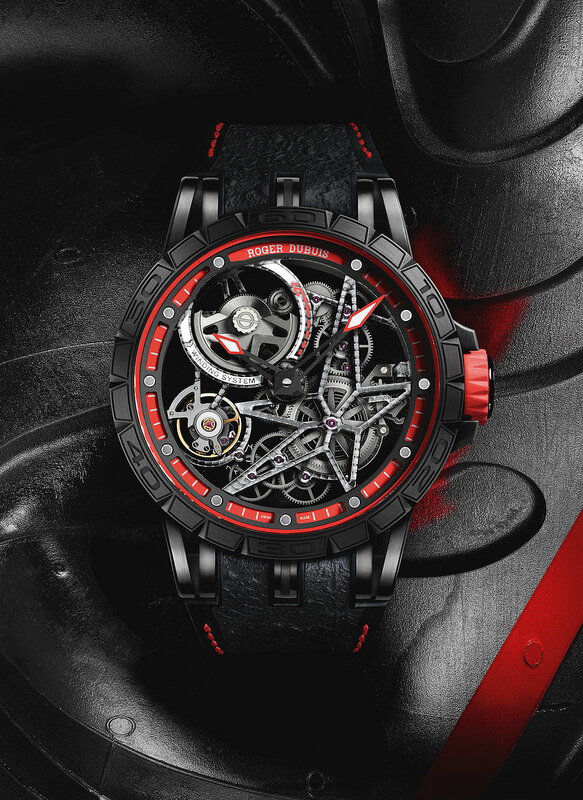 Swiss watchmaker Roger Dubuis creates some very avant-garde timepieces that may not be to everyone’s tastes but deserves admiration for their technological mastery. He started the brand in 1980 after 14 years of developing complications for Patek Philippe. It’s impossible to dismiss him as a mere dilettante no matter what. 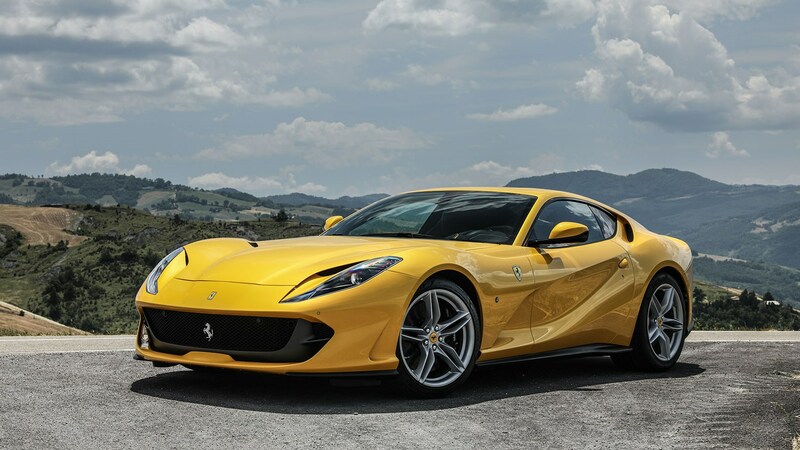 The latest initiative by the brand (which is now majority owned by Richemont), a partnership with Italian luxury tire company Pirelli, has taken it into the world of high-end motorsports and Ferrari supercars. Pirelli not only puts out the famous Pirelli Calendar featuring naked supermodels, it’s also the exclusive tire supplier to Formula 1 and sponsors the Ferrari World Championship Finals at Daytona, the race track that gave the Rolex Daytona collection its name. 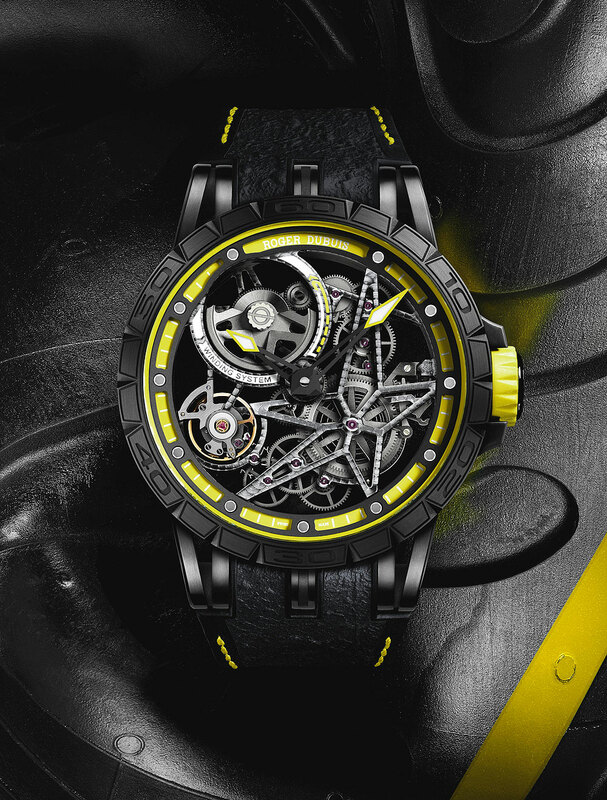 The Excalibur Spider Pirelli collection is the result of this high-octane partnership. 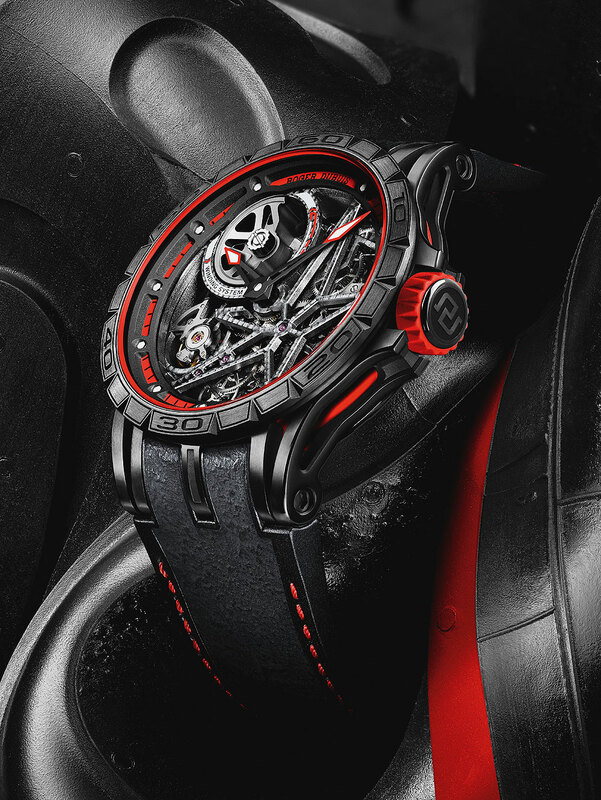 The coolest thing about the assemblage of skeletonized, DLC-coated titanium watches may, in fact, be the straps made of Pirelli tire rubber from race-winning cars. At $287,000, the flagship model of the collection, the 47mm Excalibur Spider Pirelli Double Flying Tourbillon costs almost as much as a new Ferrari 812 Superfast. Suffice to say this is not a watch for Sunday drivers or the faint of heart, and its provocative looks pair perfectly with supercars if not much else. Only eight examples will be made for collectors worldwide, and we’d be pretty surprised if they aren’t all snapped up by guys who have garages full of Ferraris – with walls covered in Pirelli calendars – anyway. If $287K seems a bit steep there’s a more affordable option: the Excalibur Spider Pirelli Automatic Skeleton, available with red, blue or yellow race car-inspired highlights and limited to 88 pieces each at $66,500 apiece. They don’t deliver quite the same performance at the Tourbillon – powered by the manual-wind Dubuis Caliber RD105SQ with two flying tourbillon carriages and 365 parts, 28 jewels, and a 50-hour power reserve. In contrast, you can get by with an automatic in-house movement with 167 components and looks that will still melt those calendar girls. Skeletonized watches are all the rage so you’ll be perfectly on trend as well. If you already own the 812 Superfast, this is the watch for you.